A couple of weeks ago, I wrote a piece for DemocraciaAbierta, following this year’s political carnival in Rio where I reflected on resistance against –and repression from—the Brazilian government, and on how challenging the times that lay ahead were. Unfortunately, shortly afterwards, I am here writing again in the wake of this tragedy that occurred last night in Rio. 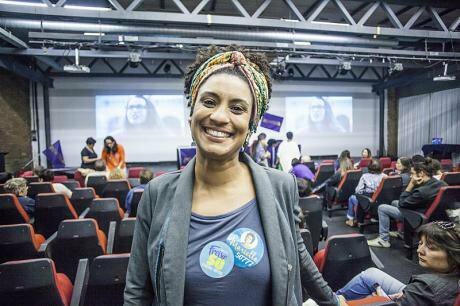 Marielle Franco, a member of the leftist party PSOL, who had the fifth most votes as a candidate for city councilor in Rio de Janeiro (2016), was shot dead on her way back from an event about black women’s empowerment. Marielle (aged 38) was black and lesbian. She came from a very deprived background; she was raised (and currently lived) in Favela da Maré (Maré Favela), one of the poorest slums in Rio de Janeiro. She was in her car when nine shots were fired at her from another vehicle. Marielle and Anderson Gomes (her driver) were killed at the scene and the Councilor’s PR assistant was injured. Initially, the terrible fact was broadcasted by the Brazilian mainstream media withoutan appropriate focus on its highly political implications, but it was the international press who immediately stressed the political dimension of such a tragic and highly symbolic crime. Marielle (aged 38) was black and lesbian. She came from a very deprived background; she was raised (and currently lived) in Favela da Maré (Maré Favela), one of the poorest slums in Rio de Janeiro. Her outstanding career was marked by her fight for human rights and fairer realities for minorities in her city. The Councilor had to battle her own reality in order to become a Sociologist, as well as an MA in public administration. With a defiant platform focused on minorities and inclusion, she beat the odds when elected for the Rio de Janeiro’s Municipal Chamber in 2017. Marielle’s fiercest fight was against the brutal police violence enforced towards Rio’s embattled favela populations. Only a day prior to her assassination, referring to the killing of a favela resident, she tweeted: Another young man’ homicide that can be credited to the PM (police) account. Matheus Melo was leaving the church. How many more deaths will it be needed in order to end this war? The increasing support for her causes stirred up fear among conservative layers of Rio’s administration, as her platform posed a threat to the status quo. The fact that her life had such a violent end, by an allegedly targeted and racist assassination, does not provide hope for those fighting for change. Brazil’s cities have become so filled with criminal violence, and there has been so many charades with the justice system, that this is inevitably leading to a total breakdown of trust between the people and their institutions. The President’s order to put the military in charge of Rio was justified by the need for 'securitization', the need for improving safety and increasing protection of the citizens. Rio’s military intervention one month ago was very concerning, and now, when something of this magnitude happens, it becomes highly alarming. The President’s order to put the military in charge of Rio was justified by the need for 'securitization', the need for improving safety and increasing protection of the citizens. Wait. Improvement of safety?! For whom? Aurea Carolina de Freitas e Silva, a member of the PSOL party and the most voted city councilor in the city of Belo Horizonte, in the state of Minas Gerais, who also identifies herself as an activist black woman, spoke to me in the light of recent events and for the occasion of this article, stressing the heartfelt note released by her office, and expressing her profound pain and deep concern for what is in store for politicians and activists that fight for minorities, such as herself in her heartfelt note released by her office. We shared a common dream of a better country. Today, while the body of another black woman falls to the ground, this very dream breaks into pieces. She described Marielle as: Comrade and tireless defender of Human Rights, a black lesbian woman from the favelas, an inspiration and a sister. You will be, forever present! Aurea Carolina stated the feeling of hopelessness that her death brings about: we shared a common dream of a better country. Today, while the body of another black woman falls to the ground, this very dream breaks into pieces. Throughout Brazil, marches have been organized by political movements and civil society organizations and the word has been spread through social media, with the hope to gather the highest amount of people possible to protest against the increasing violence and militarization in the country. This tragic event immediately reminds us of darker periods in the history of Brazil, when activists and advocates for change and human rights were abducted, tortured and killed during a highly oppressive military dictatorship (1967-1985). Ahead of a worrying presidential election due later this year, and amidst political processes and corruption trials targeting a good tranche of the political class, President Temer’s latest appointments of military personnel to security posts, including the first non-civilian to be the head of the Ministry of Defense since the late 90’s, have prompted the fear of a possible come back of military rule. President Temer’s latest appointments of military personnel to security post have prompted the fear of a possible come back of military rule. The lyrics of O Tempo Não Para, a famous song by Cazuza, a renowned Brazilian rock star from the 80s, comes to my head: ‘I see the future repeating the past…’. So, if this is where we are and where we are heading to, it can become true disaster indeed. Today, a red line has been crossed in our country. It is a very sad day for minorities’ and human rights defenders, and also for all of us who, only a week ago, were chanting and marching the streets of our cities across the globe and hoping for a future without violence, without abuse.